Loteria is the Spanish word for lottery. It’s also the name of a popular game in Mexico, similar to bingo. Loteria uses a deck of cards with colorful images. Each player has a board with a different set of pictures, and instead of calling out numbers on a ping pong ball, the dealer sings out a riddle for each picture. Mario Alberto Zambrano grew playing Loteria with his family in Houston. After a 17-year career as an international ballet dancer, he turned to the cards to help him write a novel about a Mexican-American girl trying to understand her place in the world. Zambrano talks with Diane about why he switched careers and the inspiration for his writing. Mario Alberto Zambrano Novelist and former contemporary ballet dancer. Excerpted from “Loteria: A Novel” by Mario Alberto Zambrano. Copyright © 2013 Mario Alberto Zambrano. With permission of Harper Publishing. MS. DIANE REHMThanks for joining us. I'm Diane Rehm. Loteria is the name of a popular game in Mexico. It's like Bingo, but with bright colorful images instead of numbers. To win, the players need to solve a riddle to match the pictures on their boards. "Loteria" is also the title of a novel by Mario Alberto Zambrano. His 11-year-old narrator, Luz, draws on a deck of Loteria to solve the riddles of her complicated Mexican-American family. Mario Zambrano joins me in the studio. MS. DIANE REHMYou're welcome to be part of the program. Give us a call, 800-433-8850, send us an email to drshow@wamu.org, follow us on Facebook, or send us a tweet. It's good to have you here. MR. MARIO ALBERTO ZAMBRANOThank you for having me. REHMYou started writing this book as a memoir. What happened? ZAMBRANOWell, when I started writing, after I had quit dancing, I was beginning to be a little bit nostalgic of where I came from, and that was my Mexican-American upbringing in Houston. And I started remembering this game that I used to play with my family, this game Loteria, which, you know, my grandmother would play and my grandfather would play, the entire extended family would play, and it just holds such a great place in my heart, that I wanted to find a way to sort of draw out a Mexican family of -- and write a book that was going to be like a family portrait, and use the cards to sort of inspire character sketches and episodes that had happened when I was younger at my grandmother's house. REHMBut I gather you were a little concerned about violating privacy. ZAMBRANOExactly. And that's exactly why I had to pull out of that idea. Because as I was writing the stories of my family, I realized there were biographies that were past stories that I did not know about them, and so I started inventing them, and I felt like I was invading their privacy or invading -- I was telling a story that was not mine, but theirs. And so I pulled out, and I was about -- and for that draft I was about 20 cards in, so I had already built the setting, that Mexican-American community, and it was so rich and it felt so right, and I didn't want to leave it. ZAMBRANOSo at that time, even though I pulled myself out of the story, I started to imagine what it would be like if there was a fictional family who lived down the block and what their story would be. Then one day I sat down to write, and in my mind I saw a young girl running down the stairs, arms in the air. ZAMBRANOExactly. And she came to me, and her name was Luz, and I started listening to her, and with the device of how I was writing the memoir, which was I was shuffling the deck and turning the cards over to see what inspired me about my family, I gave that sort of practice to her, and through that method of telling the narrative of her story I found out what her story was. ZAMBRANOWell, you know, I started dancing when I was 11, and I was fully committed to it, and devoted to it, and it was my life. I was not only in love with it, but I felt when I was dancing I was more myself than ever in my life. And so I was in love with dancing. But throughout my career, I began to sort of be disheartened by the relationship of being a dancer and working for choreographer, stepping into a studio and working so hard emotionally and physically, and mentally for the creative work of someone else. ZAMBRANOAnd that was beginning to get me very exhausted. And I loved dancing. I still love dancing, but that sort of commitment to someone else's creative work was not what I wanted to be -- how I wanted to be spending my time, and so I left it because it was starting to affect about how I felt about my, you know, my dancing. REHMDid you move into choreography yourself? ZAMBRANOI did. I did. I choreographed for a few companies and I did a few ballets, but what I found -- this is a funny, and a very big difference between dancing and writing. But when you're a choreographer you're dependent on people. The people are your -- are the language that you need to use to make your piece, and these people have emotions and they're sensitive and they have egos. And you walk into a studio and you almost have to manage these people and be kind to them, but yet motivate them and inspire them. ZAMBRANOBecause they were exhausted, or we had been working already for two hours, or it wasn't working and they're getting frustrated. I'm getting frustrated. And in those moments, which I think happens in all creative processes, I would rather be alone. I can work hours at a time. I can write an entire chapter, and if I don't like it, if it's not working, I can ball it up, throw it across the room and no one's going to get their feelings hurt. ZAMBRANOBut when you're working with dancers, if you choreograph a duet and it's not working, and you have to make the decision that we're not going to put this on stage, it's not going to part of the work, you're taking something away from them. And so I found that I didn't feel entirely comfortable. I was more concerned with how they felt than how I should be focusing my energy in the creative work, in the actual work, and what it's requiring for it to be come, you know, richer, better, have more quality to it. REHMWhat was it like for you as a young Mexican boy to go into ballet in the first place? Why did that come about, how, and what did those around you make of that? ZAMBRANOThey need male dancers. There's always very few that are interested to take ballet. And I got into ballet much later. I started with jazz and tap. A lot more, you know, sort of -- I was that kind of kid that would watch MTV videos and learn the choreography, and when mom and dad would get home, I'd push the coffee table to the side and say, look what I can do. And so that sort of more social kind of dancing was what attracted me to dance. ZAMBRANOAnd so about two years into it, when I would go to a competition or try to go to a better school, everyone kept mentioning get some ballet technique, you need some ballet technique. You've got some musicality in you, you've got a lot of heart. Now you need some technique. And so that's when I went to the Houston Ballet Academy to study ballet, and which was wonderful. I did find that there were other boys there, you know, of other minorities as well, that I could sort of relate to, and in general, because the world of dance, it's almost a separate world than every other sort of social group, once you step in, you're embraced and brought into a family of dancers. And so I felt very happy there. REHMWhereas the writer's work is very lonely work. REHMIs there, in your own mind, a transition between the writing and the ballet, or the ballet and writing in terms of what you do and how you do it? ZAMBRANOI would say -- I was talking to a friend just the other day about, you know, they asked, do you miss dancing, and I told them, what I miss most is the moment on stage. And the reason why is because when you step out on stage, you have the entire house, and they're full -- it's full of people, and they're quiet, and they're in the dark, and they're watching you, and so you give them the utter respect of giving everything you have. You give them your entire self, and you are not distracted by your worries or your personal dramas. You leave that to the, you know, off stage. ZAMBRANOAnd in that moment, you are so focused with the artistic person that you are, and everything that you're trying to express, that it's heightened. You're sort of -- there's a sort of heightened experience in that moment. It's very thrilling and fulfilling. And in writing, which is completely different, because we don't have a stage and no one's watching us, no one really, you know, is going to hold you accountable whether you go to work and right every morning or not. ZAMBRANOBut if you get to work and you find yourself writing in a story and slowly those personal dramas start to leave you, and you get lost into a story, I find it's a kind of focus that the mind and your heart come together, and it's a similar place like when you're on stage, when you're in those first drafts, or when you're working deeply in a piece of literature. That's really comforting and it puts me at a place of peace. REHMOf course you're moving words around. You are moving sentences around. You are choreographing your own mind's thoughts. ZAMBRANOYes. And no one's getting their feelings hurt if I take out a paragraph, which is great. Yeah. No. And I find -- I have noticed that my interests fall into how stories are designed, which has an aesthetic component, similar to sort of dancers' form and how choreographies are put together, but also the musicality of how prose works is very -- like, brings in my attraction and connection to music. And so in the way a dancer dances to music, I think there's a way that the voice in a piece of literature dances to its own language. REHMMario Zambrano. He was a contemporary ballet dancer for 17 years. Now he has turned to writing. His new novel, his first, is titled "Loteria: A Novel." He'll read after a short break. REHMAnd if you just joined us, Mario Zambrano is with me. He has written really beautifully illustrated novel. It's titled, "Loteria." and in fact is a game. We are going to open the phones shortly, taking your calls, 800-433-8850. Mario, describe the game for us. ZAMBRANOSure. Loteria is basically a Mexican version of bingo. Everyone -- every player gets a board of a grade of four across, four down. And they are 16 square. Each square has an image that is part of a collection of 54 images. And there's a dealer who deals the cards and he calls out every card. And when your appropriate square is called, you cover it. When you have four across you sing loteria, and you win which is exactly like bingo. REHMWe have to be thinking very quickly. ZAMBRANOExactly. And looking at your board and whoever's dealing the cards does not really wait or give you time to solve the riddle. ZAMBRANOIt could be up to 10 people. ZAMBRANOThat's why when you think about an extended family, all of your cousins, all of your aunts and uncles. ZAMBRANOAnd then you have your grandmother at the end of the table. It's just the most beautiful thing. And I think, you know, that's one of the biggest reasons why I was attracted to it. ZAMBRANOOh, the spider. I'm so connected to the spider because I remember the day I went to a coffee shop to work on the book and I shuffled the deck and I flipped over the top card and it was the spider. And it was the voice of Luz Castillo came to me. But on that day, I just sat down to write and her voice sort of came through me and I wrote it down. And then I got a phone call and I stepped outside. ZAMBRANO...when everything falls into place. I thought, this is it. This is meaningful. REHMSo now you will introduce us to the narrator, the 11-year-old. ZAMBRANOSure. "My name is Luz. Luz Maria Castillo and I'm 11 years old. You've known me since before I was born, I'm sure. But I want to start from the beginning because who else should I speak to but you? It's been five days since I've been here and I don't have anything but a week's worth of clothes and a deck of loteria. The best thing to do now is to be patient and cooperative, they say. ZAMBRANOOtherwise, I'll be sent to Casa de Esperanza. Tencha can't have custody, not unless we move back to Mexico, and they say that whenever I'm ready to talk it'll make things easier. But Tencha told them she filed her papers and has been working here for eight years, so why don't they let me go? Why can't she take me? I'm waiting for the day she walks in and tells me to pack my bags because we're going home, wherever that is." REHMAnd that is truly a question about not only identity, but belonging and where this young child is, tell us a little more. ZAMBRANOShe -- her parents came from Mexico and moved to south Texas. They have two girls. Luz's older sister is Estrella. And Luz, the protagonist, is the only one who's born in America, only natural-born citizen. But she is the middle of these two cultures of Mexican culture, of American culture. And as she's growing up, she's dark skinned, yet her sister is lighter skinned and she refuses to speak Spanish, though it's still part of the music that's in her mind, even throughout the book. REHMShe is at the, as the book opens, she's in the custody of the state of Texas. Why? ZAMBRANOWell, the book opens and something traumatic is happening. We don't know what it is. But what we do find out is that her older sister Estrella, by two years, is in the ICU in the hospital. Her mother has disappeared a year earlier and her father has been put in jail. And the only other relative that she's close to, her aunt, Tencha, can't get custody of her because she's illegal. She doesn't have legal papers. ZAMBRANOAnd so little by little -- and she's not speaking. This is another important element to the book. She's been traumatized in selective mutism of keeping quiet. And so -- and they're trying to urge her to just speak out to the counselor. And then her aunt, Tencha, has the idea because Luz loves this game, loteria, and she's taken with her this deck of loteria cards. So she coaxes her and says, why don't you use the cards to help you tell the story? ZAMBRANOLike that they can find out what happened in this family and why he's in jail. And so that's what she begins to do. She starts to shuffle the deck and she starts to flip the cards. And little by little she starts to reveal what happened. REHMAnd now, read for us starting on page 15, El Cantarito. ZAMBRANOEl Cantarito. "When Estrella ran away, I thought she was going to Angelica's house because she wanted to scare Papi into thinking she was leaving for good. We thought she was being dramatic and wanting attention. I never thought she'd go to the cops. I never thought they'd come to the house the way they did. Julia asked the same thing over and over when she sits down next to me in the activity room. ZAMBRANOShe wants to know what it was like living at home. And on weekends, she asks, what did you all together? What did you do with your Papi? But she wouldn't get it. She wouldn't know what it was like. We all fought. We all hit each other. Papi punched because he was a man, but we hit him, too. There was one time when mom grabbed the Don Pedro bottle from the coffee table and smashed it over his head. ZAMBRANOBlood ran down his face like the statue of Jesus Christ and Estrella and I had to grab toilet paper to soak up the blood. Now, here comes Julia thinking FAMA magazine is going to open me up like some stupid jack in the box. Like if some extension cord tangled up in a garage, it can take a few minutes to untangle. Then what? She'll leave me alone? Or maybe papi will stay in jail because of something that I say, something she writes down and tangles up later. ZAMBRANOIt's like in loteria, instead of playing the four corners, we play the center squares. But midway through the game, you find you have the corners, but you're missing the center. And if you would have played the corners you would have won already. But that's how it is, isn't it? I keep my mouth shut because I don't know the rules of the game." REHMI love the shortened sentences, phrases the 11-year-old voice. How hard was it once you had her in your mind to keep that going? ZAMBRANOIt was quite difficult, I have to say. As much as I could, I try to take Mario, the writer, out of the voice. And so it was a question of impersonating her, of stepping into her mind and trying to understand, you know, what it was like to grow up in a family, an abusive family which is something, fortunately, I wasn't raised with. And so it was a stretch of the imagination, but also in terms of when to put in the Spanish language, when to be sort of meditative. ZAMBRANOWhen to be -- have some poetic sensibility, when to be frank and honest and sort of use more foul language than other. All of that balancing act was like very tricky. And once some of the cards were written, I would read it over and over and over so that some of the notes and the music of her voice wouldn't sound out of tune, if that makes any sense. REHMIt does. I wonder whether you have any concerns about using the Spanish words and phrases for an American audience, that they would perhaps be forced to run to a Spanish-American dictionary every few pages. What were you thinking? ZAMBRANOIt was -- it definitely came to mind because, you know, I just graduated from a creative writing program and through workshops that if you use a different language in your work for an American audience, obviously, you have to -- they always suggest, you know, make sure it's put in a context so that if you, you know, if a reader doesn't understand French or doesn't understand Spanish, they can still get an idea of what's happening. ZAMBRANOAnd so I was considerate of that and was trying to get that across. But at the same time, I didn't want to rip it of all the Spanish language because it was sort of -- those are the instruments. That's the song of the book. It's a drum and a piano. And so you can't create the music in her mind by stripping one from the other. And so even though it might -- I hope it's not confusing, too confusing for American readers. ZAMBRANOAnd I do think there might be sudden nuances that are within the Spanish that add more texture and layer to the book. But I hope it doesn't confuse them too much that they can't understand the narrative by the end. REHMDid you also have the current conflict over immigration and immigration reform in your mind as you were reading and as you were writing? ZAMBRANONot so much. You would think that it would have been a bigger part. ZAMBRANOBut it got so focused in what was happening to the family and having her aunt unable to pull her out. That's -- and also throughout the book she's referring this conversation not just to herself but a sort of divine presence, a you, a personal god. She's sort of trying to wake herself up or have someone else wake her up from this nightmare that she's been put in. And so the idea of immigration was definitely a part of it. REHMYeah, it's definitely in there, whether intentionally or otherwise. Mario Alberto Zambrano, his new novel is titled, "Loteria." And you're listening to "The Diane Rehm Show." You can join us, 800-433-8850. We're going to open the phones at this point. I hope many of you will join the conversation. First to Cincinnati, OH. Franzel (sp?) you're on the air. FRANZELHi. This is a very interesting interview, and I really appreciate the author's time that he took to sit down with you. I say that because I think he relates to me in a lot of ways. I also come from a second heritage and I'm also a dancer. And that brings up, I think, a really interesting question because I think having been part of the -- having had these two experiences, they definitely influence my work. FRANZELAnd I want to ask the author if his dance history and that welcoming culture that he spoke had any influence on what he was writing. ZAMBRANOGreat question, and thank you for calling in. You know, I have to admit to something that I think might answer your question. When I was growing up, during the '80s, I grew -- I was born in '77. I, similar to the girls in the book, was sort of renouncing my heritage. I would go to school and I didn't want to speak Spanish and I didn't want to identify with my Mexican heritage at all. I didn't want to be looked down upon. ZAMBRANOBecause for whatever reason, I thought that to be a Mexican in America was to be looked down upon. And so I ran away. I began dancing. And it wasn't intentional, but when I was 16 I had my first contract and I bolted out of there. It was part of a world, dance world that did embrace me. But as I got older, I started looking back at my childhood and my heritage and realizing how rich and beautiful and passionate and artistic and religious and great it is that I immediately became ashamed and embarrassed of how much I had resisted it when I was going up. ZAMBRANOAnd which is what drew me to wanting to write "Loteria," to come out and wear it like an emblazoned M on my chest and say this is who I am. REHMSo, you're also perhaps to our caller's question, you move from embracing and being embraced by the dance culture to then turning and embracing your own culture. REHMDoes that answer it, Franzel? FRANZELI think that's a very good answer. REHMBye-bye. And to Marianna in San Antonio. Hello there. MARIANNAHi, thank you for taking my call. MARIANNAI definitely look forward to reading "Loteria." And as a Mexican-American myself, I as well have embraced my culture in an extremely positive way and open to world cultures as well. And I would like to encourage Mr. Lozano (sp?) if he would contemplate writing Mexican-American history. I really enjoy history myself and I just don't find hardly anything out there in the books. It's starting to come out, but not fast enough. ZAMBRANOI agree, I absolutely agree. I think that was, you know, the idea of the book is to give rise to a voice or to get -- to finally speak up and hear the voice in the air and have people witness that voice. And now as a sort of a contribution to a certain Latin American literature, if you want to say it in those terms. But in terms of writing Mexican history, I haven't really thought about it simply because other projects are arising. And so, I've got to tend to those sort of ideas that are on my plate. REHMMario Alberto Zambrano. The book we're talking about, "Loteria." Short break, right back. REHMAnd we're back with Mario Alberto Zambrano. His first novel is titled "Loteria," which also happens to be the name of a game played not only in his family, but in his novel. Now, here's an email from Gail who says, "I teach Spanish to 6th graders ages 11 and 12. Is the content and reading level appropriate for preteens? I'm creating a reading list to share the culture of the Spanish-speaking world and of Hispanics here in the U.S." Mario. ZAMBRANOI think this is an excellent question and it's posed to me a few times. But my brother has four girls. I have four nieces. One of them is 15 and the other one's 11 and then they're younger, 5 and 3. When the book came out I gave it to my sister-in-law first because I wanted her to read it before she gave it to my nieces. And after she read it she said, oh it's fine. I mean, there's -- warning, there's abuse, there's language. But she felt they were mature enough to be able to take it on, that there's other young adult novels out there that can deal with some sort of graphic nature that they're sort of prepared to read. ZAMBRANOBut to answer that question I would say if anyone was going to put it into a reading list for an educational purpose, I would say read it first and just judge for yourself. REHM...for yourself. Good thinking. To Fort Worth, Texas. Hi, Esther. You're on the air. ESTHERHi there, how are y'all. ESTHERWell, I'm intrigued by the book. I'm definitely looking forward to reading it. And I just relay, I'm a baby boomer and so I'm a product of everything you can think of during the '60s and '70s. And I had an aunt, she was from Uiniwako (sp? ), Mexico. And when she was brought over and married my uncle, she kind of -- we had a communication problem, if you want to call it a barrier. But with Loteria we just got to get to know her. And she was so confident with her game of Loteria that it really -- I guess that it kind of helped her reach us. REHMNow why don't you read for us about people playing this game. ZAMBRANOSure. This is from the card (word?) . "Outside, if it wasn't raining, people would give thanks to Padre Felix like if he were some movie star. There'd be a crowd waiting to grab his hands and Papi would give thanks to him, too. But then he'd wait on the side and I'd stand next to him smelling his sleeve, waiting to leave. Sometimes mom would make me go give thanks and I would because I had to. But then we'd all walk to (unintelligible) and she'd say the sopita was ready. ZAMBRANOPoncho would puff up his chest and tell us about the spices he used to rub over the steaks we were going to eat. I'd start to hear the clicks of beer cans going off every few minutes from my tio sitting by the garage under the patio, and the voices of my cousins running around the house chasing each other. ZAMBRANOAnd after we were done eating fajitas and frijoles and elote, we'd sit at the long table made of three other tables pushed together, some of us on stools, some of us in chairs. 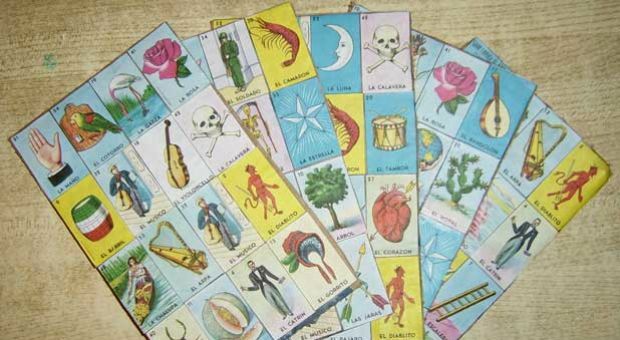 We'd take out the jar of pinto beans and bottle caps and loose change so we could play Loteria. We'd lay out the tablas and choose the ones we wanted, some of us with two, some of us with four. We'd play a round and fill a vertical line then a horizontal. Two diagonals making an X. And then the corners las escquinas. ZAMBRANOAnd once we were crowded around the table with our necks stretched to see the pile of cards being dealt, lacha lupa, elpescado, el caso, we'd play a round of blackout. And by the time the game would've gotten faster and louder and it would've been hard to keep up with the images stacking up in the middle of the table, whoever was dealing would throw them down and sing the riddles. And someone would miss a card. They'd scream wait, slow down chingow. What was the last one? But we'd keep going. ZAMBRANOWe'd play until the sun outside didn't even seem bright anymore, until one of us had everyone else's money, a bulge of quarters and nickels and dimes kept in a Ziploc bag where it was kept until the following Sunday when we'd take out of tablas and bottle caps and loose change and do it all over again." REHMI can feel that. I can feel that. Just wonderful. Let's go to Lorinda. She's in Miami, Fla. Hi, there. LORINDAHi. Thank you so much for taking my call. This is so fabulous because being of Mexican American heritage, la Loteria is our life. The pinto beans, oh my gosh, that cracks me up. Took me all the way to my childhood. We used to use pennies, beans, whatever we could find. LORINDA...our version. And we all have it. And I thought, my goodness, this is so relatable what he is doing. You are bringing life to what is so much of our tradition, our heritage. And, you know, it's one of those things like your grandmother's apple pie for some people, you know? REHMThat's wonderful. Very, very special, Lorinda, that you had your own version. Nichole from San Antonio sends an email saying, "I just wanted to note that one in five people in us are bilingual. And most of these are Spanish speakers. When you say you're writing for an American audience many, if not most of us, can appreciate bilingual writing. Thank you for the topic and for your writing. That's lovely. REHMLet's go to San Antonio, Texas. Hi there, Bill. BILLYes, you got Bill on the phone. I'm looking very much forward to reading his book. I would like to share it with my (unintelligible) my daughter-in-law's (unintelligible) . She's a Mexican and American, born in Mexico and raised and married my son. She would get a big kick out of that. REHMWell, I do recommend it. Here's what I want to know, Mario. How do you explain -- and we heard you read this about hitting in the family -- how do you explain Luz's violent relationship with her father? ZAMBRANOThis is a very tricky question because it's almost like posing the question, why does someone write a tragic story? And for one, Luz is brought up in a family under circumstances that puts her father into a sort of depression. He begins to drink. And through rage of wanting to do the right thing and when someone does a wrong thing, he sort of -- this passion, this outburst that puts him off. And he begins to hit his children and they hit him back as a defense. ZAMBRANO...we know we're outside of it. We understand that it's wrong and she's trying to forgive him for something that is unforgiveable. Why, why does this happen? But I think that sort of tragic human experience is out there. And whenever any of us -- I think, every single life that is lived suffers tragedy at one point or another. And the question is, how do you live with it? How do you continue? How do you narrate to yourself the story that happened to you and then move on? REHMTo Greensboro, N.C. Hi there, Gay. GAYHi there, Diane. It's so good to talk to you. GAYAnd I thank you for having this wonderful author who obviously has a lot to contribute as an author. But I want to ask again about him being a dancer. I've been a dancer all my life. I just celebrated my 80th birthday and I danced at that birthday. And I write a little. I write letters to the editor but I can't sit down for more than an hour. I have to get up and move. How does he manage sitting all that time without getting up and moving? What does he do for his body, for his movement sense? ZAMBRANOWell, I used to -- I would love -- usually I write in the morning. I write from like 8:00 to about noon or 1:00. And then I get antsy because I'm, you know, not moving, which is the biggest difference between dancing and writing. You do not move at all. And for a long time I would go out and go jogging just to get my body going. But unfortunately because of, you know, the dance career, my right hip has arthritis and it gets inflamed. So I've been told that I can no longer jog. It's not great for my hip. ZAMBRANOSo I've begun to do yoga. I do yoga. I bike. I do, you know, simple exercise activities sort of thing. And every now and again -- every now and again I do get up and push the coffee table against the wall and dance a little bit, I have to admit. ZAMBRANOOh, I'll just put in some either classical music or even one of my favorite pop songs that's on the radio. And I sort of leave my mind out of the equation and I allow my body to speak for itself. And through, you know, the movement it sort of -- it exercises itself. REHMI would think that would actually help your writing, to clear your mind by use of your body. And then go back to writing. ZAMBRANOYeah, I think -- a few times when I was at the -- going through my graduate program, I -- some of the poets -- because we were divided between fiction writers and poets. And some of the poets would send me their poetry, like an audio file. And it became a thing. I would write for about two hours and then I'd get up and I would move to their poems. ZAMBRANOSo it wasn't even music but, you know, poetry is so musical in itself, with the line breaks. And so I began doing that. And that was quite fun. I did enjoy doing that. And then I would send it. I would videotape it and then send it to them and they were thrilled. And they saw their poetry in motion in a sense. ZAMBRANOAnd so that was fun. But it sort of -- I stopped doing that after a while. I should continue doing that. I should go back. REHMYou should continue. And you're listening to "The Diane Rehm Show." Let's go now to Lynn. She's in St. Louis, Mo. You're on the air. LYNNOkay. I'm delighted to be on. Buenos dias. LYNNI'm a retired Spanish teacher and I finally have time to read novels in Spanish. So I've been reading like crazy. And I'm just wondering, have you written your book in Spanish also? REHMCould someone else do it? ZAMBRANOSomeone else, yes, definitely I hope will see -- I'm thinking, you know, if everything aligns, you know, if Spain buys the book or if some other Latin country buys the book then they'll have it translated. But if that doesn't happen, there might be a point in the future where that decision will have to be made because I think it'd be great in Spanish. REHMI predict it will happen. Here is an email from Jennifer in Dallas who says, "I'm a professor of counseling and would like my students to read your book to increase their multicultural competence. What do you think the takeaway is for counselors working with Mexican American adolescents who have experienced domestic violence?" ZAMBRANOThat's a tough question I think because for one, I'm not a counselor. And so -- but whether a Mexican American child, an African American child, a Caucasian child, I think any child that has been put through some sort of trauma or is wounded in some emotional way, they need a sort of connection, someone in front of them that they can trust and begin to sort of reveal themselves. And through that revealing they can start to understand how they can get beyond whatever pain they're suffering. ZAMBRANOAnd for the book, in terms of -- you know, journal writing is extremely therapeutic. And, you know, whether for a book to be shaped as a novel or personally, when someone -- I myself do it all the time when I'm in pain, when something, you know, personally happens, I feel at peace when I write it out. There's a way that another voice comes through the writing itself that will help a child, that will help an adult. So that's my two cents to that. REHMI think that you're absolutely right that the writing is one way. The talking is another way. And this counselor could indeed be informed herself and help to relate to others through the information she receives through the game. REHMThe other thing I predict is that this game Loteria is going to explode. ZAMBRANO...now that everything's online, online shopping I believe you could just Google it. I know eBay sells it. Probably Amazon sells it. But I've passed -- I've been living in New York for a while and there's a few shops that I pass. And I get really excited when I see the Loteria game (unintelligible) . REHMAnd I hope you will also get excited when you see the book "Loteria" by Mario Alberto Zambrano. Congratulations. ZAMBRANOOh, thank you very much. REHMThank you for being here. Thanks for listening all. I'm Diane Rehm.